After months of saying that he was interested in protecting Dreamers, President Donald Trump made the decision to rescind the work authorization for undocumented immigrants brought to America as children through the Deferred Action for Childhood Arrivals (DACA). Rather than own up to the cruel flip-flop himself, he sent out his beleaguered Attorney General, Jeff Sessions, to make the announcement. The federal government will accept no new applicants for DACA, and will allow reapplication for only one month after the announcement date of September 5. 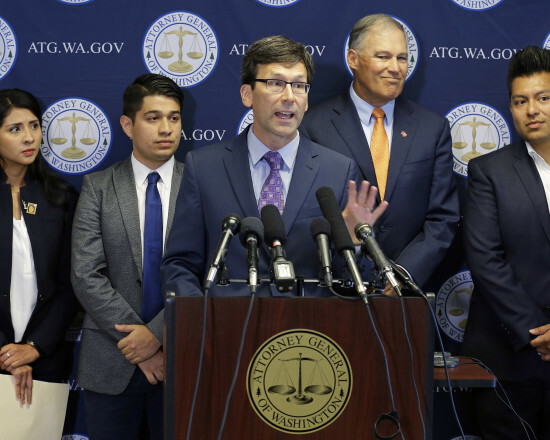 This callous decision directly impacts the 19,000 DACA recipients in Washington State, and has wider effects on their families and communities. As activist Quiñonez Figueroa with Washington Dream Coalition said, “Having a few extra months to prepare for the end of life as we know it is not treating us with empathy or with heart.” For LGTBQ undocumented youth, the end of DACA poses additional threats to their lives. Monserrat Padilla, a transgender immigrant activist, recalls coming out as queer in “undocumented spaces [as] a very frightening thing to do.” For Padilla and other queer undocumented immigrants, the loss of DACA means the loss of yet another support system that endangers their wellbeing. Not only does this mean that more queer immigrants are likely to start hiding their sexuality or gender identity, but for those who face deportation, it means the very real threat of homophobic or transphobic violence in the countries they are deported to. And while activists across the state have been calling on Congress to pass the DREAM Act, they are not willing to accept a deal that would jeopardize the lives of their parents or friends who would be targeted if further immigration enforcement funding were contingent on the Act’s passage. While Federal efforts to provide protections for immigrants remain mired in the gridlock, activists in Washington State have been rectifying the errors in our immigration system right here at home. Padilla put her education on hold to fight for the REAL Hope Act, which qualifies undocumented residents of Washington State for in-state tuition at colleges and universities. There is still important work to do in our communities for our undocumented neighbors. While advocacy on the federal level for passage of a clean DREAM Act will remain an important element of that work, the intransigence on the part of Congress makes our local efforts all the more important. In Tacoma, inmates of the immigration prison Northwest Detention Center have gone on hunger strikes twice in the last year to protest their living conditions there. The company which owns the Detention center has also been sued by the state for paying the laborers less than minimum wage for work that they do.